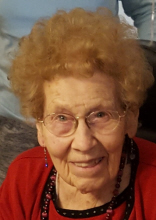 Virginia “Ginny” B. Humpert, age 102, passed away Tuesday evening April 9, 2019, at the Genacross Lutheran Services, Wolf Creek Campus. She was born to Walter and Helen (Koester) Gable on March 19, 1917, here in Toledo. Ginny was a graduate of Libby High School and worked as a manager for the Franklin Ice Cream Company and later worked for various Research marketing firms as an interviewer, retiring in 1982. Ginny was married in 1936 to Harlan Stahl and had three daughters; Sharon, Carol and Betty. She married Hilary Humpert in 1951 and had three more daughters; Jill, Jackie, and Vicki and a son Kim. Many of her life experiences included: living through the Great Depression and World War II, the first time seeing an airplane in the sky, learning to drive a car at age 12,seeing a night launch of the space shuttle, and traveling extensively around the USA and the world. She was a strong independent woman who was an excellent cook, loved to play cards, she had a keen since of humor, was good at playing the piano, line danced and bowled well into her 90’s and loved her family above all else. Visitation will be held at the Walter Funeral Home, 4653 Glendale Avenue, Toledo, on Friday April 12th from 3 to 8 p.m. The funeral service will begin at the funeral home on Saturday at 10 a.m. with burial to follow in Toledo Memorial Park. Please consider memorial donations to the First Church of Christ Scientist, 228 Dudley St. Maumee, Ohio, 43537. Condolences for the family may be left at walterfuneralhome.com. To send flowers or a remembrance gift to the family of Virginia "Ginny" B. Humpert, please visit our Tribute Store. "Email Address" would like to share the life celebration of Virginia "Ginny" B. Humpert. Click on the "link" to go to share a favorite memory or leave a condolence message for the family.